Oh, hey, that confusing headset brouhaha wasn’t the only spot of controversy in last night’s 28-21 New England win. Ben Roethlesberger took issue with the Patriots’ defense’s tactics on a crucial third-and-goal, a shift designed to draw the Steelers into a false start. 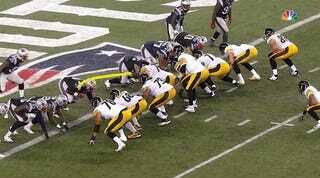 It worked to perfection, and Roethlisberger wonders how the Patriots got away with it. Early in the fourth quarter, with Pittsburgh down 10, the Steelers found themselves with first-and-goal from the one. After two failed attempts to get in, New England’s defensive front shifted in concert, causing two of the Steelers’ linemen to jump. LT Kelvin Beachum was flagged for the false start. It was clearly a designed play with the express intent of doing exactly what it did. 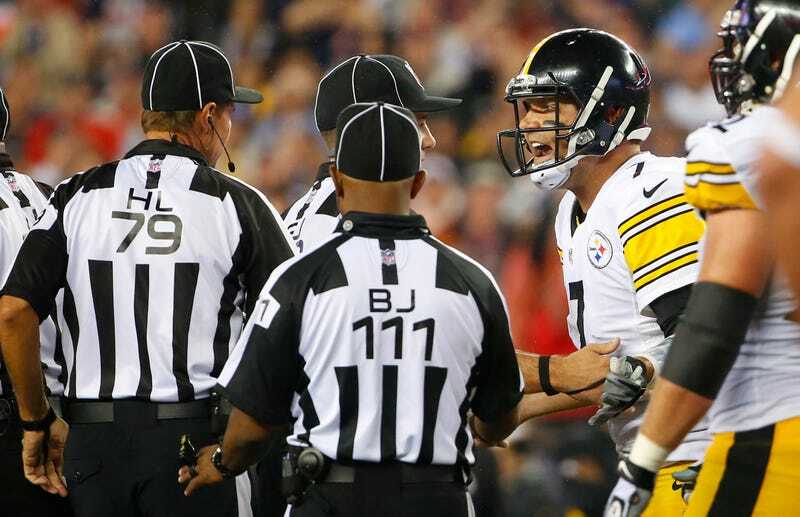 Roethlisberger screamed at the officials, begging for a flag on the Patriots, but to no avail. Even after the game he remained a bit salty. “I thought that there was a rule against that,” Roethlisberger told reporters. “Maybe there’s not. Maybe it’s just an unwritten rule. … We saw it on film, that the Patriots do that. They shift and slide and do stuff on the goal line, knowing that it’s an itchy trigger finger-type down there. The proper penalty for that violation would be an unsportsmanlike conduct call on the defense. But how do you define “disconcert,” or even “acts” here? It’s vague, frustratingly and perhaps intentionally so: it gives leeway to the officials. Historically, the rule has been invoked to punish defenses for giving vocal signals—here, the Patriots were instead cued to move on Roethlisberger’s cadence—though merely shifting has on occasion been flagged. It was not out of the ordinary for the Steelers to be penalized; it would not have been unheard of for the call to go against the Patriots. Football is confusing. Chalk this one up as another mini-coup by the Patriots, who, perhaps more than any other team, are aware of exactly what they are and aren’t allowed to do and aren’t afraid to push at the boundaries that aren’t so firm. It’s a minor thing, but these minor things add up—the Steelers had to settle for a field goal and never got any closer than seven.